This is not how we expected to start our mission. We left Fillmore at about 9:30 am on Friday morning, had a nice visit with Suz's Mom, Micaela and John and then arrived at the Salt Lake Airport about 12:30. We caught a flight to Dallas/Fort Worth which went well and we left DFW about 9:30 pm with great expectations of being in Santiago, Chile by morning. After a nice dinner about 11pm, we settled down hoping for a little sleep before morning. About 6 am (Chile time--2am Utah) the captain came on the PA system stating that he had a very important announcement and needed everyone to wake up. He was quick to mention that the plane was in no danger and our safety was not in jeopardy. After giving us about five minutes to wake up, he informed us that we had turned around and were headed to Miami because of a "substantial" earthquake in the Santiago area. Power was out and the airport was closed. Wow, we were utterly amazed and somewhat dazed. Many on the flight were Chilean nationals and were of course, extremely worried about their families and home. We wished we could be there to help. 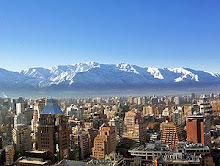 We knew that our family and friends would be concerned about us, and we were very concerned about the people of Chile. No further information was available to us until we arrived in Miami about 7 am. We disembarked from the plane and waited until an announcement came for us to reload and go back to Dallas/ Fort Worth where our flight would end and assistance would be given in the form of vouchers or rescheduling when the Santiago airport reopens. While there we received our first email from Lucho Espinoza, a dear friend from the Benson Institute who is Chilean himself. We appreciated his interest in us and the information he provided. We called our son John and asked him to contact our other kids. We reboarded and flew back to Texas, arriving about noon. We had now been in an airport or a plane for 24 hours--grateful that we were safe and that the damage appeared to be better than expected in Santiago itself due to the better infrastructure. The earthquake was 900 times the strength of the earthquake that had leveled Port-au-Prince, Haiti, and so the fear was that the capital itself might be severely damaged. Unfortunately, the area around Concepcion is indeed severely damaged and there are hundreds dead. Once in DFW, we waited in line for over 4 hours to get rescheduled. We were grateful for my iphone which we were able to lend to some of the Chileans in our group and let them email their families about their safety and find out about their families's safety.We were able to contact the Church office switchboard and talk with both Dr. Doty and Missionary Travel and leave a message for the Chile Area office that we were safe. They reserved a hotel room for us for two days and at this time we have a tentative reservation for Santiago this Friday. We are hoping that the airport will open soon and we can leave here sooner than that. We got settled at our hotel about 6 pm. We just got back from a nice dinner at Denny's after having nothing to eat for 13 hrs., when we had breakfast on the plane. We are tired but doing very well and grateful for the good friends we have made and the help we have received. We are so glad that you are settled in and doing well. It sounds like it's been a really rough start! Get lots of rest. We are praying for you and hoping that you will be able to get to Santiago soon. I'm sure your help will be very welcome. Glad you are ok. Hope you get some good sleep tonight--you need it! So are you planning on just staying in Dallas for the time being? Glad to hear you are safe and soon to be on your way to Chile. Our prayers are with you. It sounds like Chile could really use you right now. I hope it all works out and is safe when you get there. Good luck.